We recommend a flag spreader for anyone looking to enhance the appearance of their indoor flag set. Our flag spreader has a vinyl coated spring steel pole grip (to avoid scratching your display pole), a large tightening screw, heavy duty brightly polished round support arms and large flag clips. 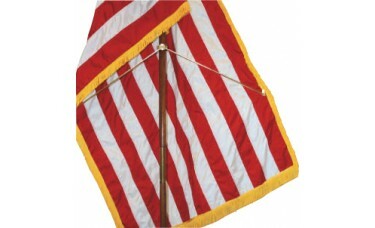 The flag spreader easily clamps to the indoor pole and spreads/drapes the flag for a proper beautiful display. Flag spreaders are particularly necessary when displaying a flag with a large emblem, such as the Israel flag. Flags such as these are not completely recognizable without the use of a flag spreader. Our flag spreader has a vinyl coated spring steel pole grip (to avoid scratching your display pole), a large tightening screw, heavy duty brightly polished round support arms and large flag clips. 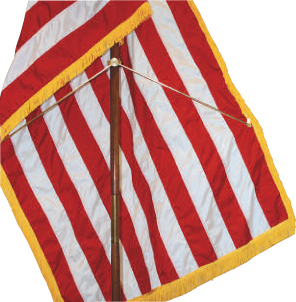 The flag spreader easily clamps to the indoor pole and spreads/drapes the flag for a proper beautiful display.